This review has been written in order to update the literature on anthraquinones occurring in the Rubiaceae. 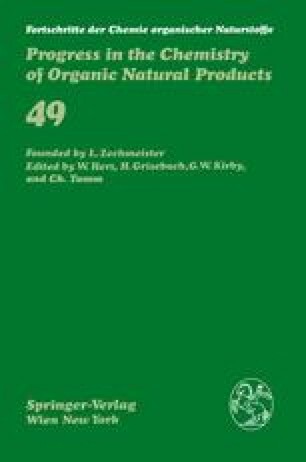 Since appearance of the excellent book on naturally-occurring quinones by R.H. Thomson (120) in 1971 about 50 new anthraquinones have been isolated from members of the Rubiaceae. Also several new methods have been used for structure analysis and separation of the anthraquinones which have not been subject to review before. For this review we have confined ourselves to the naturally occurring anthraquinones and therefore the synthesis of anthraquinones is not included. The article covers the literature from 1969 to 1984. This article is dedicated to Prof. Dr. A. Baerheim Svendsen on the occasion of his 65th birthday.